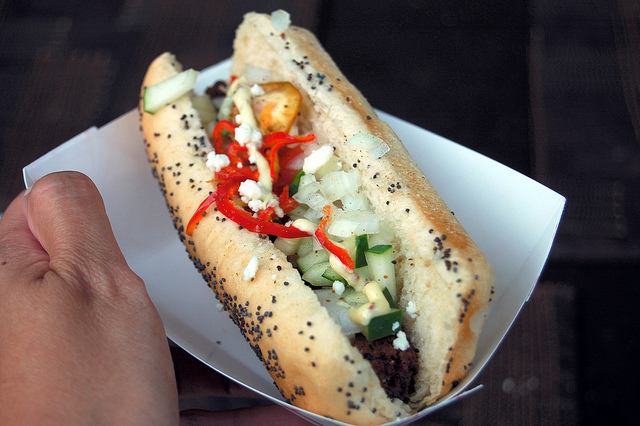 “Legislation in Chicago is sometimes harder than making sausage,” said 32nd Ward Alderman Scott Waguespack, the food truck legislative OG, at yesterday’s City Council License and Consumer Protection Committee meeting, which approved the controversial new food truck ordinance. Now, with committee approval, the ordinance goes up for vote in front of the full City Council, probably at the next meeting, this coming Wednesday July 25. Where&apos;s Schoolhouse Rock! when you need them? To reduce the risk of turning this into a law blog, I live-tweeted all four meeting hours, with emotional testimony from both sides. You can read select tweets on WBEZ&apos;s Twitter stream which culminate here. Evidently on meeting eve, Committee Chairman/37th Ward Alderman Emma Mitts and 44th Ward Alderman Tom Tunney worked late into the night to make a few key changes to Mayor Rahm Emanuel&apos;s ordinance: food trucks would be completely prohibited from operating between 2 a.m. to 5 a.m., as well as on vacant lots even with the permission of the owner. The committee discussed the difference between vacant and open lots, where food trucks are allowed, and defined as the former being "uncared for" and "overgrown." As WBEZ&apos;s own Quinn Ford reports, yes, food truck owners could cook on board but despite that MacGuffin, the current 200-foot rule still stands, with the new and higher $1,000 minimum fine, and the new GPS requirement. 45th Ward Alderman John Arena was the only committee member to vote against the new mystery substitute ordinance. Arena did however help save the historic Portage Theater yesterday, as WBEZ&apos;s architecture blogger Lee Bey reports. After nearly two hours of hearing those opposed to the ordinance testify, including 10 food truck owners, Chairman Mitts immediately called for a vote. There was no discussion. But before the commitee could take a vote, roughly half of its members had to be called back in to the room to form a quorum. After the vote I spoke with Institute of Justice Clinic on Entrepreneurship Director Beth Kregor, who testified in opposition, "I think we all know this was a fait accompli from the very beginning." I also asked Kregor to please explain to my failing live-tweeting brain the committee calling the city&apos;s Corporation Counsel in when Liberty Justice Center&apos;s Jacob Huebert testified that the 200-foot rule was unconstiutional. "The city does not have the right, under the constitution, to do whatever they want with the public way," said Kregor, "They have the right to regulate city buses, but we all know from a very painful history that they cannot tell some people to sit in the front and some people to sit in the back." "The fact that the area is one in which the city can regulate does not mean they can do anything they want."